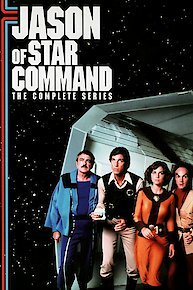 A throwback to the seventies, though set in the far future, "Jason of Star Command" is a a visually stimulating, action packed science fiction show that is based around the hero, Jason, and his characteristic crew. In command is the the man only known as the "Commander." He has an aura about him that exudes leadership and he acts as a man that lives up to his name and title. There is Jo-neen, the alluring female star character who is in love with Professor E.J. Parsafoot, who is a somewhat awkward though helpful scientist. Sam is the strong-willed psychic who lends her telepathic powers in aid of the crew. And they all band together to fight against the ill will of Dargos who, with his malevolent but delightful and hairy creatures, hatches evil plots of ambitious intent. Space battles add an exciting element vital to any space-oriented show with spaceships firing upon each other and maneuvering in the vacuum of cold space. Dragos kidnaps the Commander so Jason tries to free him from his asteroid prison. Can Jason's courage overcome the evil of Dragos at last? Dragos and Star Command vie for the secrets hidden in Heidi's doll. Jason and Samantha discover a young girl called Heidi and her doll in the wreckage of a crashed spaceship. After Samantha rescues a young boy from a lost spacecraft, Star Command is plagued by a series of strange incidents. Banished into limbo by Dragos, Jason and the Commander meet a Tantalusian ghost. In order to save Jason, Professor Parsafoot must help Dragos read the secrets of the Tantalusian powerdisk. Episode 12 - Beyond The Stars! Dragos sends an undercover agent into Star Command to kidnap Professor Parsafoot. Captured by Vanessa, an ally of Dragos, Jason is offered vast wealth and power to join her evil crusade. A deadly Freeze Ray threatens Star Command. Jason and Samantha land on a remote planetoid and discover Dragos is behind the evil threat. Jason is in trouble with the new Commander but discovers Samantha, a mysterious woman preserved in suspended animation aboard a space wreck. Having obtained vital secret information, Jason sets out to confront Dragos, man to man. While under attack, Jason rescues Peepo, who has fallen under the control of Dragos and returns the robot to Space Command. The evil Queen Vanessa captures Jason, Nicole and Parsafoot and turns them over to Dragos. Space Command is in danger when Peepo, Dr Parsafoot's marvelous new robot, is captured by Dragos' minions and has his memory banks scanned. Jason must then rescue a colleague trapped in slow time. Jason, Nicole and Parsafoot are marooned on a planet trapped in time by Dragos. Seeking gold to repair their spaceship, they encounter the mysterious Captain Kidd. Nicole initiates a rescue mission to save Jason and Princess Allegra. As Star Command is forced towards a burning star, Jason escapes from Dragos and finds an ally in Princess Allegra. Star Command is attacked and Jason is captured by the sinister Dragos. Jason of Star Command is currently available to watch and stream on Filmation Assoc.. You can also buy, rent Jason of Star Command on demand at Amazon online.